The HWA recently transitioned to a more efficient and robust database system to accommodate its growing membership. The database software is called Wild Apricot and is hosted entirely online. This allows updates to be “live” and reflected as they occur. In this document, we’ll walk you through some of the functionality that Wild Apricot provides. Please note that this functionality is for Members Only. For more info on joining the HWA, please visit horror.org. We recommend opening this page in a separate tab of your browser so that you can reference it while navigating the system. To login, enter your login information in the lower left hand corner. Your login information for Wild Apricot is separate from your login info for horror.org. If you do not remember your login information, then you can reset your password by clicking the “Forgot Password” link shown above. 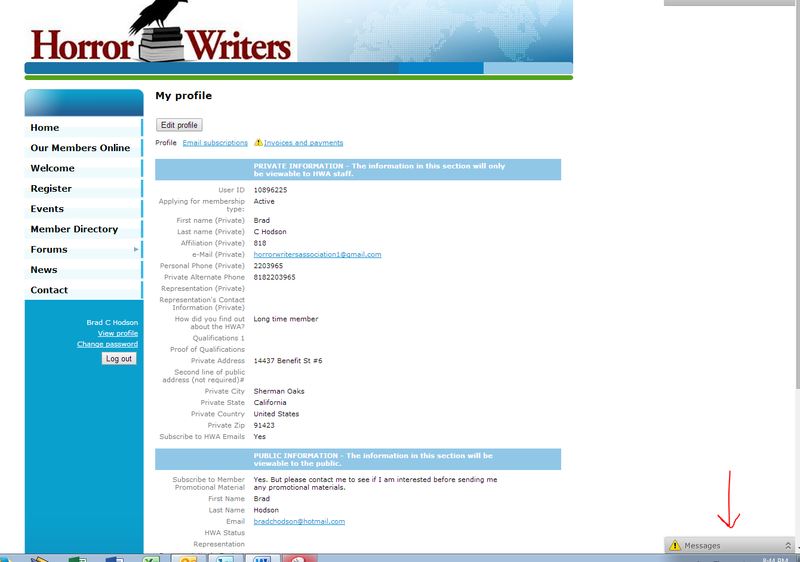 HWA Members can now update their profile information themselves. Once you have logged in, you can access your profile by clicking the “View Profile” link in the lower left hand corner beneath your name. Once logged in, you can click “Edit Profile” to access your profile. Once clicked, all of the fields on your Profile become editable. Make whatever changes you wish and, when completed, click “Save” or “Cancel” at the bottom of the page. Please note: The “email (Private)” field is used for both HWA to contact you and as a login for your profile. When changing your profile, please make sure that this address remains a current one. This will more often than not be used to renew your dues, but may also be used to pay any other outstanding invoices (such as tickets to an event). You can also, at any time that you are logged in, click the “Messages” tab if it appears in the lower right hand corner. Any outstanding invoices will be listed there as well. Once logged in, you will see a list of your open invoices. Click the invoice for more information. At any point you can click “Pay Online” to pay the invoice. This will immediately take you to PayPal Express to make the payment. While PayPal is the portal we use for payments, you do not need a PayPal account. You can click “Pay with Debit or Credit Card” to make a payment without a PayPal account. 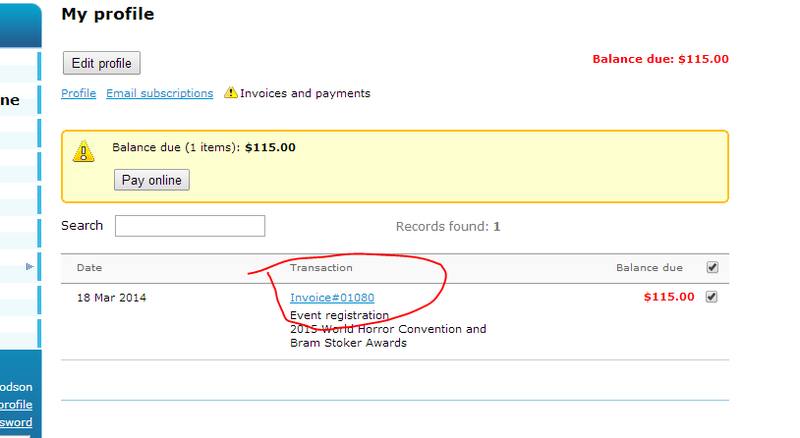 If you would like to make a payment in an alternate way, please contact admin@horror.org. Wild Apricot has a robust search function for searching through our member database. While there is a Public facing version (“Our Members Online”), the “Member Directory” can only be accessed by other HWA members. Once in the directory, you can browse or do a simple search. You can also perform a more in depth search. This is helpful when looking for other members of a local chapter, members in an area that you may be travelling to, members eligible to vote, or a number of other criteria. 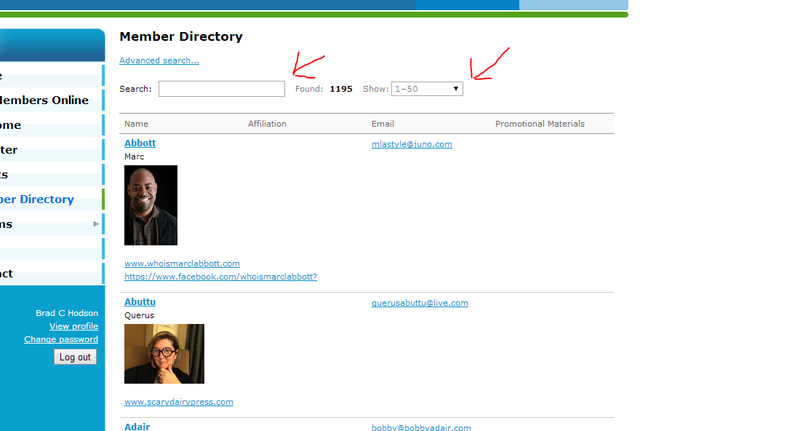 Once you click on Advanced Search, you will be able to search by any field in a member’s profile. There will be dropdown menus in one column and then a text field in the next. From the dropdown you can select how the search should be conducted (is, contains, does not contain, etc), while the text column is where you will enter what you are searching for.